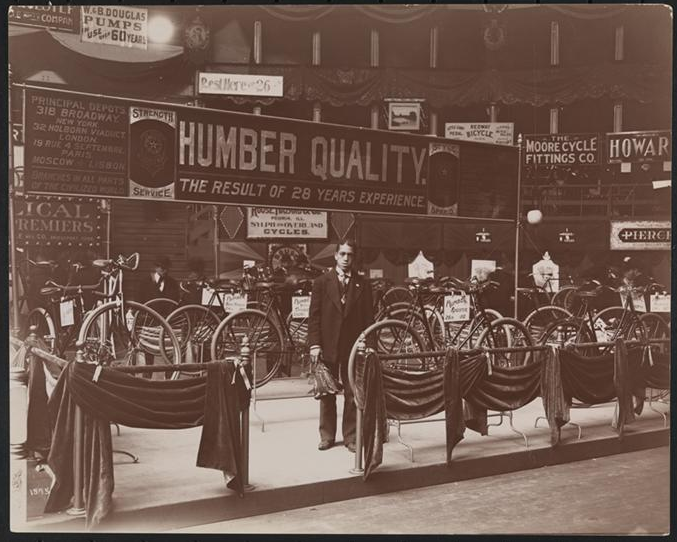 A representative from the Humber Bicycle Company at the 1896 bicycle show at Madison Square Garden. Image via the Museum of the City of New York. The New Amsterdam Bicycle Show is happening Saturday, April 30, from 10 AM to 7 PM, part of the big kick-off to Bike Month. It’s New York’s first big bike show in years and there’s a lot of great stuff going on all day, including giveaways, gear demonstrations, an “urban bicycle fashion show,” book signings, and more. I’m speaking on a 4 PM “Bikelandia” panel, “Building a Better City for Biking with Bike-Centric Blogs,” with Ben Fried from Streetsblog, Marc van Woudenberg of Amsterdamize, and possibly others, moderated by Caroline Samponaro, the Director of Bicycle Advocacy for Transportation Alternatives. There will be a Q&A, so please come and give us your best. The New Amsterdam Bicycle Show will take place at Center 548 on West 22nd Street, not far from the West Side Greenway. I hear there will be valet bicycle parking, so there’s no excuse not to ride there!